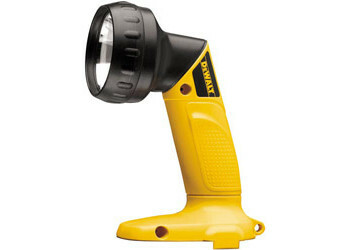 Dewalt Heavy-Duty 14.4V Cordless Pivoting Head Flashlight. Pivoting head rotates 90° which allows light to be projected in any direction. Wide-angle beam maximizes light over a specific work area. Extra-bright Xenon bulb maximizes brightness of beam. Lightweight, compact design makes the flashlight durable and portable.